Modbook, the company with a history of offering pen-based Mac tablets using the internals of Apple's notebooks, is announcing a new Kickstarter campaign today to support the launch of a new Modbook Pro X based on the 15-inch Retina MacBook Pro. The $150,000 campaign will allow users to send in their own machines for conversion at $1999 or reserve complete systems directly from Modbook starting at $3999. An innovative computer modification product, the Modbook Pro X incorporates the original hardware of a Retina-display Apple MacBook Pro 15.4-inch base system running the OS X 10.10 Yosemite operating system. The expansive drawing and writing surface of the Modbook Pro X has a scratch-resistant ForceGlass screen with paper-emulating texture that covers a crisp, clear 15.4-inch Retina display with a resolution of 2,880 by 1,800 pixels. Users get highly sensitive pen input with 2,048 pen pressure levels and pen tilt and rotate functionality for producing pro-quality creative deliverables. 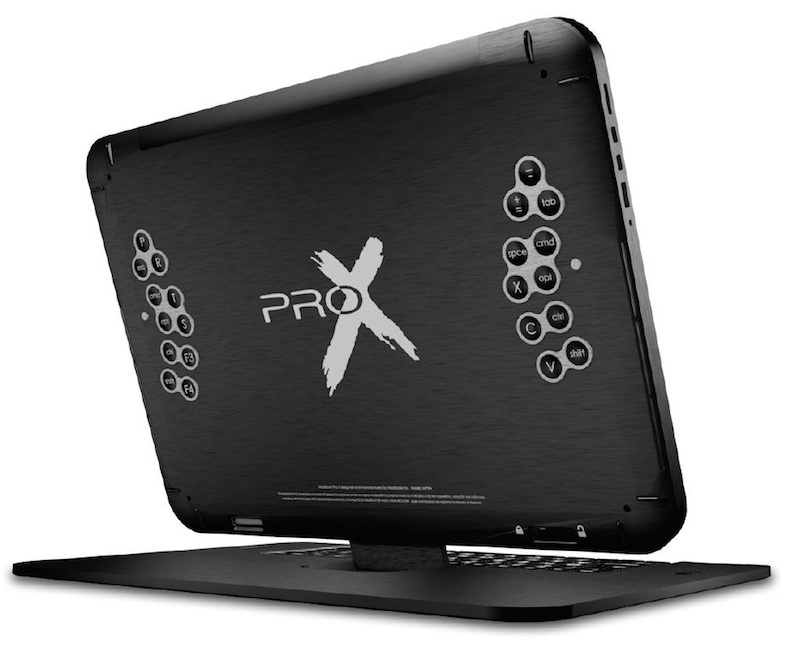 Various configurations of the Modbook Pro X are available, including processor options ranging up to the top-of-the-line 2.8 GHz chip launched in the Retina MacBook Pro just yesterday, up to 32 GB of RAM, and up to 2 TB of flash storage. Additional options for Modbook Pro X customers include integrated Keybars on the rear of the device providing eyes-free programmable access to key combinations for commands and shortcuts, as well as a Keyboard Stand that serves as a keyboard, adjustable easel stand, and protective cover for the Modbook Pro X. Shipping on complete systems is scheduled for January 2015 in limited quantities, with the bulk of orders starting the following month. Send-in-your-own systems are planned to begin shipping roughly a month later. Given its price, the Modbook Pro X is obviously targeted at a niche market interested in a tablet running full OS X such as creative professionals, but for those people the device may be an appealing option. For others, particularly those who would appreciate an OS X-based iPad, it's at least an interesting example of what can be done. Backers not interested in a full Modbook system can also support the project through cheaper rewards such as a $59 Modbook Digitizer Pen that is compatible with an array of pen-based tablets or a Modbook Shuttle portable hard drive starting at $139. If you don't know what the second device is, it's a Cintiq. It's a pen-abled screen meant for professional digital artists. It is widely used and indispensable to most digital artists' workflow. It's meant to be used in conjunction with desktop computers and creative desktop applications such as Photoshop, Illustrator, Storyboard Pro, etc.--again, it is not intended (nor able) to be used with mobile OSes and apps. As indispensable as they are to digital artists, the downside to relying on Cintiqs is that they pose a problem for artists whose job requires a lot of moving around. They have a 13" version that is technically portable, but having to carry and set up an external monitor in addition to your laptop greatly diminishes portability value. 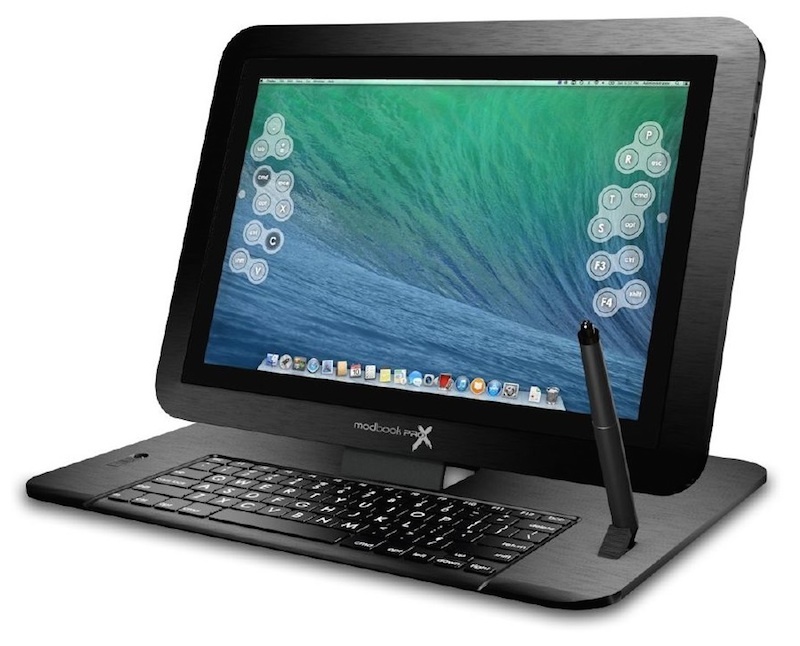 PC-based artists have for a long time had a vast number of options for an ALL-IN-ONE pen-abled laptop solution (Surface Pro, Wacom Companion, many various tablet-PCs and hybrids), while Mac-based artists have had absolutely zero options (until the Modbook came along), since Apple is the only company to make Mac and OS X, and they have never shown interest in digital pens. And I'm pretty sure Apple does not have a problem with the Modbook, because all it can do is promote more Mac sales, since you need a Macbook in order to make a Modbook. What I wonder is how Axiotron is able to use Wacom pen technology, since the Modbook seems to compete directly with the Wacom Companion. Maybe because it's a different OS Wacom allows it. Those buttons on the back look like the worst idea ever. $4000 for an untethered, portable, all in one, with a retina-resolution display? The Modbook's a steal, and a heck of a lot more convenient. As for Apple, they've granted Axiotron permission to offer their parts & service since 2007. You can stop speculating on what you think Apple will think about this. It's not new. You're just late to the party. It's a niche product for a certain subset of people. The ModBook has been around for a long time and was showcased at several MacWorld Expos. At a minimum they have tacit approval from Apple brass to continue to produce these products. You want OS X on your tablet? Get an iPad. It's OS X with a UI designed for a tablet. *facepalm* it's not about having a tablet. I guess for normal people like you a tablet is simply a place you watch youtube and fb in. For us artist when we hear tablet, it's a screen or a surface we can paint on with a pressure sensitive, accurate pen. as it says in the article their mod even has pen tilt and rotation just as a wacom tablet. you are not getting who they are targeting this tablet to at all. Tick this box if you want your amazing new Macbook Pro to look like a ten year old PC. And I'm pretty sure Apple does not have a problem with the Modbook, because all it can do is promote more Mac sales, since you need a Macbook in order to make a Modbook. What I wonder is how Axiom is able to use Wacom pen technology, since the Modbook seems to compete directly with the Wacom Companion. Maybe because it's a different OS Wacom allows it. Finally. 4 pages, 80-something responses and only 3 or 4 people that actually think long enough to get it. I have the Cintiq 13HD and if you are doing anything like drawing, design or photo work, after you try a pen display once, you will not want to give it back. It is so much better, easier, more precise and quicker than mucking around with a touch pad or a mouse or even just a regular pen tablet. If anyone even for a second thinks you can be as precise and efficient with a finger, a touch pad or a mouse instead of a pen drawing directly on your work like you would be on paper, you are, not to insult anyone, but clueless. Apple can't ban it. It's their computer that people are tweaking. Your comment suggests that people can't tear apart the computer they buy from Apple or reassemble it. The most Apple can do, and they do this, is void the warranty.